It’s been a rainy summer, so it may just be a rainy fall, too. What are you planning on doing with the kids during those drizzly days? Thankfully, you don’t have to spend hours coming up with activities for them. We’ve done all the work for you! Here at PrintablesFree.com, you’ll find a great variety of indoor games and activities that you can complete with your child when it’s dark and dreary out. The best part is that they’re fun and educational, too. Here are just a few of free printables categories that you can turn to when you need a fun-filled activity. Do you have a word whiz in your family? Print out some of our free printable crossword puzzles for Mr. or Miss Smarty Pants! They’ll love the challenge that these crosswords provide. The difficulty levels vary, and there’s an appropriate puzzle for all age and ability levels. The puzzles are bright and colorful, sure to be lots of fun for your kid. Some puzzles use pictures rather than definitions, which makes it more fun for the younger kids to guess what the words are. If you have more than one child, they may enjoy a crossword race to see who can complete their puzzles the fastest. Give it a try! If crossword puzzles aren’t your child’s style, perhaps he will enjoy navigating through our super fun free printable mazes. Again, we have mazes in a range of difficulty levels so that you’ll find something suitable for most age groups. Our mazes are in fun shapes and colors, including flower shaped, apple shaped, cowboy shaped and more. Your kids will have a blast while they try to work their way out of these tricky mazes. In addition to using them for rainy days, you can also print them out and take them with you as a ride along activity for a road trip. They’ll keep the kids busy and entertained while you get going where you need to go. Finally, who doesn’t love a good board game on a rainy day? They’re the favorite go-to activity of many families, and for good reason. They’re tons of fun! We have free printable board games that you can print out and make up your own rules as you go along. These games feature dolphins, dogs and more. Also in the board games category, you’ll find an amazing assortment of printable jigsaw puzzles for some of your children’s favorite characters! Cars, Winnie the Pooh and Disney Princesses are all here just a click away. Finally, everyone’s favorite – tic tac toe – is one of the most popular downloads we have. 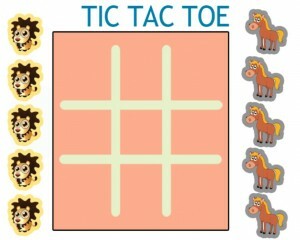 You can print out these tic tac toe boards, all of which have their own game pieces so you can reuse them again and again. No writing involved! We recommend laminating these boards and pieces to help them last longer if you have little ones. We hope you enjoy our rainy day games and activities. Don’t forget to print and share with your friends. What are your family’s favorite rainy day games?